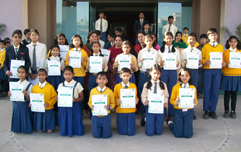 Prestige Public School, Indore focuses as much on human excellence as on academic and environmental excellence. UNESCO coins “learning - the treasure within”. Education on human values is now finding place in Curriculum recommended by NCERT. Ministry of Education, Govt. of India has placed EHV on top priority as policy matter in its educational planning. Prestige Public School is therefore have the teachers oriented in value education with Why? What? & How? of EHV. The School library has adequate resource material available concerning value education. The school pays special attention to nurture among teachers and students the values like truth, peace, love, non-violence, tolerance and righteousness highlighted by all religions and philosophies.